© 2018 Ntabo et al. Microorganisms are a preferred source of enzyme production due to their high production capability and low cost of production. Bacterial endophytes occupy unexplored sites hence they represent a new source of enzymes with diverse applications. Mangrove plants in Kenya have traditionally been used as medicinal plants due to their bioactive metabolites. However the enzymatic activity of mangrove plants associated endophytes has not been studied. The study is aimed at bioprospecting for enzymes with potential biotechnological applications from mangrove ecosystems. Forty-two bacterial isolates were cultured and isolated from the leaves and roots of six mangrove plants sampled from Mida Creek and Gazi Bay in the coastal region of Kenya. The isolates were screened for pectinases, chitinases, cellulases, proteases, and amylases. The isolates were identified based on morphology and 16S rRNA gene sequences analysis. The study showed bacterial isolates had enzymatic activity as follows; pectinases activity (69% of the isolates), Proteases (95% of the isolates), amylases activity (88% of the isolates), cellulases and chitinases (92% of the isolates each). Bacterial endophytes from leaves showed a higher enzymatic index of cellulases suggesting a potential role in degrading cellulose in the leaves of plants. The enzymes amylases and proteases were mostly exhibited by endophytes in roots suggesting a potential role in metabolizing sugar and amino acids in the roots. 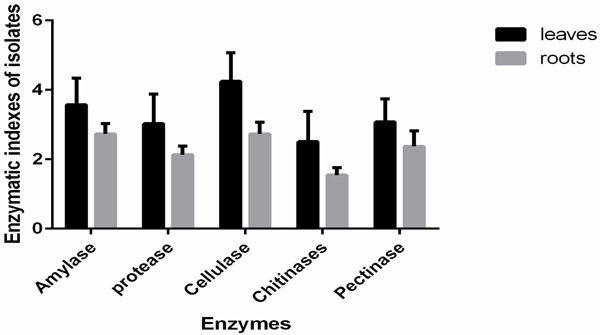 Isolates from the mangrove plant Sonneratia alba showed highest enzymatic indices. The study also observed that isolates from mangrove plants sampled from Gazi bay had high means of enzymatic indices. Molecular identification showed the isolates were closely related to Bacillus, Streptomyces, Myroides, and Staphylococcus species. Their respective enzymatic activities have been provided in this study. The study showed that Kenyan Mangrove plant-associated bacterial endophytes provide a good reservoir of enzymes with potential industrial applications. Keywords: Endophytic bacteria, Mangrove plants, Enzymes, Mangrove plan, Sonneratia alba, Enzymatic index. Endophytes are microbes that inhabit asymptomatically in the living tissues of plants without causing any substantive negative effect . They colonize the plant tissue both inter- and intracellularly where they exhibit complex interactions with their host . Each plant that exists on earth is considered to be a host for one or more of these endophytes. These endophytes vary from one plant species to another and their diversity depends on the climatic condition of a particular region and age of the plant . Mangrove ecosystems are intertidal productive wetland forest that mostly constitutes halophytic plants. This environment is unique with its highly characterized organic matter, sulfur and nitrogen that are very important for bacterial growth . Mangrove plants have been shown to have medicinal properties with over two hundred natural products whose antibacterial, antiviral and antidiarrheal activities have been potentially confirmed . Plant-associated endophytes are a potential source of enzymes such as cellulases that can be used in biotechnological and pharmaceutical processes . These hydrolytic enzymes can also be used in bioremediation process since they can break down complex biopolymers into sugars . Studies have also shown that endophytic microbial enzymes such as pectinolytic and cellulolytic enzymes are involved in the infection process . Endophytes in mangrove plants occupy a relatively unexplored site in microorganism isolation and can be a source for enzymes that can be utilized in food processing, detergent industries and pharmaceutical companies . The intimate and non-detrimental association between endophyte, their host plant and the complex substrates involved may provide a unique habitat causing the endophytes to develop various mechanisms producing a variety of bioactive compounds  or bioprospecting for potential industrial enzymes. While most of the investigations on endophytes have been focused on terrestrial plants, the potential of bacterial endophytes of mangrove plants especially those isolated from Kenya’s mangrove ecosystem as a source of beneficial enzymes has not been investigated. The study hypothesis states that mangrove plants in Kenya have bacterial endophytes with potential enzymes. The objectives of the study were to isolate, identify and enzymes screening of bacterial endophytes from leaves and roots of selected mangrove plants found in at Mida Creek and Gazi Bay in Kenya coastal region. Mangroves plants were collected from two sites namely Mida Creek which is located in Malindi County on the North Coast of Kenya and Gazi Bay which is located 55 km South of Kenya’s coast. The Leaves and roots samples were collected from six mangrove plant namely; Rhizophora mucronata Avicenia marina, Sonneratia alba, Lumnitzera racemosa, Bruguiera gymnorhiza gymnorhiza and Xylocarpus granatum. The samples were transported in sealed bags and kept in a cold room at 4 °C and processed within 24 hours. Approximately, 1g of roots and leaves of the mangrove plants were surface sterilized with 70% ethanol for a few seconds and further disinfected in 3.8% sodium hypochlorite for three minutes to eliminate surface contaminating microbes. The samples were then rinsed in sterile distilled water and air dried in the laminar flow hood to eliminate residual disinfectants. The samples were excised and macerated in sterile distilled water using mortar and pestle. Approximately 1ml of the sample was serially diluted in normal saline and 0.1 ml aliquot was spread on different media. The study utilized various unconventional media with low nutrient and supplemented with sea water to assimilate the natural ecological niche of the endophytes. The media were as follows; M1 media contained 12 g of starch, 4 g of yeast extract, 2 g of peptone, 18 g of agar and 1000 mL of distilled water; NASEA media contained 23 g of nutrient agar and 1000 mL of seawater, NaCl media contained 23 g of nutrient agar 20 g of NaCl and 1000 mL of distilled water; Differential media contained 12.5 g of glycerol 1.0 g of Arginine, 1 g of NaCl, 1g of K2HPO4, 0.5 g of MgSO4.H2O, 0.01 g of FeSO4.H2O, 0.001 g of CUSO4 H2O, 0.001 g of MNSO4.H2O 20 g of agar and 1000 mL of distilled water. DNBA media contained 0.08 g of nutrient broth, 20 g of agar and 1 L of distilled water. D.D (Modified DNBA) media contained 0.08 g of nutrient broth, 20 g of agar and 1 L of seawater . The plates were incubated at 30°C for up to seven days. Based on distinct morphological characteristics, individual colonies of the cultures were isolated from the primary culture and streaked on fresh respective media in which they had grown to obtain pure cultures were isolated. The ability of the identified bacterial endophytic isolates to produce enzymes that hydrolyzes starch, casein, chitin, cellulose, and pectin was performed by streaking the isolate on solid media containing respective substrate. After incubation, observing clearance around the bacterial growth indicted presence of the enzyme. . Presence of amylase enzyme was determined using starch agar containing 0.2% soluble starch and 1.5% agar. Freshly prepared isolates were inoculated by streaking using a sterile wire loop and incubated at 30ºC for 18-24 hours to allow bacterial growth. The hydrolytic activity of the isolate was then confirmed by addition of iodine according to the method described by Bibi et al. . A clear zone around the colonies confirmed the presence of amylases. The enzymatic index was expressed by the relationship between the average diameter of the halo and average diameter of the colony growth . The presence of proteolytic enzyme was determined using skimmed milk agar for protein hydrolysis. Freshly prepared isolates were inoculated by streak method using a sterile loop on milk agar and incubated at 30 ºC for 24 hours. Detection of the hydrolytic activity was determined by a clear zone around the colonies according to the method described by Jones and Jack . A translucent zone around the colonies was an indication of degradation of the substrate by proteases. The enzymatic index was expressed by the relationship between the average diameter of the halo and average diameter of the colony growth . The presence of cellulases was determined by inoculating the bacterial isolates on media that contained the following; 3.0 g NaNO3, 1.0 g K2HPO4, 0.5 g MgSO4.7H2O, 0.5 g KCl, 0.01 g FeSO4.7H2O, 1.0 g cellulose powder and 15 g agar, pH 7.0. The plates were incubated at 30 ºC for 48 hrs. After incubation, the plates were flooded with 0.1% Congo red for 20 minutes. A translucent zone around the colonies indicated the presence of cellulases according to the method described by Hung et al. . The enzymatic index was expressed by the relationship between the average diameter of the halo and average diameter of the colony growth. Pectinases activity was detected by streaking isolates on media containing trypticase soy agar supplemented with 1% apple pectin (Galacturonic acid 74% dry powder) and incubated at 30°C. After 48 hours of incubation, Lugols Iodine solution was flooded on the colonies. The presence of a translucent zone around the colonies indicated the presence of pectinases enzymes according to the method described by Hung et al. . The enzymatic index was expressed by the relationship between the average diameter of the halo and average diameter of the colony growth . Colloidal chitin was prepared from chitin flakes which were ground. The chitin was slowly added into 600 ml of concentrated HCl and kept for 60 minutes at 30 ºC with vigorous stirring in a chemical fume hood. This mixture was then passed through layers of muslin cloth to remove the large chunks of chitin. The clear filtrate obtained was then treated with 2 L of distilled water to allow precipitation of colloidal chitin. This was incubated overnight under static conditions at 4 ºC to facilitate better precipitation of colloidal chitin. This was later pressed through 2 layers of course filter paper. Approximately 3 L of tap water was passed through the colloidal chitin cake until the pH rose to 7. The colloidal chitin was autoclaved and stored at 4 ºC until further use . The screening was performed by single line streak of bacterial inoculum in the center of Starch casein agar and nutrient agar containing 0.1% colloidal chitin and incubated at room temperature. The zone of clearance due to chitin hydrolysis was observed after five days of incubation according to the method described by Priya et al., 2011 . A total of forty-two bacteria were isolated from the leaves and roots of mangrove plants and were distributed as shown in Table 1. Table 1. Distribution of bacterial endophytes obtained from mangrove plants. Morphological studies showed that of the twenty-three isolates from the leaves of mangrove plants, 61% were Gram-positive bacteria while 39% were Gram-negative as shown in Table 2. The Gram-positive organisms were identified as Bacillus species and Streptomyces species while the Gram-negative isolates were identified as shown in Tables 2 and 3. Table 2. Molecular identification and morphological characteristics of the bacterial isolates from the leaf as observed under a compound microscope (x100). Key for identifying the codes: Site: G- Gazi bay and M-Mida creek. Media: Act/Ac- M1 media, N- Nutrient agar mixed with NaCl, R-M1 media, A – Differential media, S- NASEA media, B-DNBA plus sea water and D- DNBA plus distilled water. Numeral-obtained from the primary culture; Source plant; XG-Xylocarpus granatum, AM-Aviccenia marina, SA- Sonneratia alba, BG- Bruguiera gymnorhiza, LR/ Lumn-Lumnitzera racemosa and RM-Rhizophora mucronata. Table 3. Molecular identification and morphological characteristics of the isolates from roots as observed under a dissecting microscope (×160) and a compound microscope (x100). Key for identifying the codes: Site: G- Gazi bay and M-Mida creek. Media: Act/Ac- M1 media, N- Nutrient agar mixed with NaCl, R-M1 media, A – Differential media, SN- NASEA media, B-DNBA plus sea water and D- DNBA plus distilled water. Numeral; obtained from the primary culture-. Source plant; XG-Xylocarpus granatum, AM-Avicenia marina, SA- Sonneratia alba, BG- Bruguiera gymnorhiza, LR/ Lumn-Lumnitzera racemosa and RM-Rhizophora mucronata Plant part-root or leaf. Out of the nineteen isolates obtained from the roots of mangrove plants, 84.3% were gram-positive bacteria while 15.7% were gram-negative as shown in Table 3. The Gram-positive organisms mainly had characteristics typical of Bacillus and Streptomyces species while the Gram-negative isolates had characteristics resembling members of Myroides species. Enzymatic Index (EI) was tested in all the isolates from mangrove plants (Table 4). The results show that the enzyme amylase was detected in 78% of the isolates, chitinases (75% of the isolates), proteases (71% of the isolates), cellulases (68% of the isolates) and pectinases activity was detected in 61% of the isolates. The study showed that cellulase activity was mostly expressed in isolates from leaves suggesting a potential role in colonizing the leaf tissues as shown in Fig. (1). Table 4. Enzymatic activity of the isolated bacteria from mangrove plants. The enzymatic index represents the mean halo diameter of degradation/ diameter of bacterial colony in cm of four replicate experiments. Mean values of enzymatic indices within the same column followed by the same letter don’t differ significantly among themselves (Turkey's b, p<0.05. Isolates grouped together based on morphology and biochemical tests. Key for identifying the codes: Site: G- Gazi bay and M-Mida creek Media: Act/Ac- M1 media, N- Nutrient agar mixed with NaCl, R-M1 media, A – Differential media, SN1- NASEA media, B-DNBA plus seawater and D- DNBA plus distilled water. Numeral; 1-27. Source plant; XG-Xylocarpus granatum, AM-Avicenia marina, SA- Sonneratia alba, BG- Bruguiera gymnorhiza, LR/ Lumn- Lumnitzera racemosa and RM-Rhizophora mucronata. Plant part; leaf and root. Fig. (1). Graph showing various Enzymatic indexes of isolates in leaves and roots. Two way ANOVA p=0.328 df=1. Statistical analysis using one-way ANOVA showed that the enzymatic indexes were significant between the different enzymes at df=4 F= 13.683 and p=0.0001. One-way ANOVA showed that enzymatic index of the different isolates was significant at P=0.0001 at F=7.023, df=42 suggesting that the different species had different degradation capacities of the substrates in their environment through the production of respective enzymes. Interaction of species and enzyme was analyzed using two way ANOVA and results showed means were significantly different at p=0.0001, F=10.238 df=168 suggesting a significant difference in means of enzymatic assays on different plant parts. Analysis of the enzymatic indices based on plant parts showed a significant difference at p=.0328 df=1 with leaves showing highest index. The results showed the bacterial endophytic isolates had different ability to utilize starch, cellulose, protein, chitin, and pectin and could potentially have a role to play in their environment as shown in Table 4. Highest amylase activity was observed in isolate MA25RMroot isolated from Rhizophora mucronata roots sampled from Mida creek as shown in Table 4. Majority of the isolates from the leaves in all mangrove plants expressed high cellulases activity especially isolate MXG2leaf suspected to be Achromobacter isolated from Xylocarpus granatum leaves sampled from Mida creek. Least enzymatic activity was observed in chitinases by two isolates suspected to Serratia and bacillus isolated from Rhizophora mucronata and Avicenia marina roots. Sampled from Mida creek and Gazi bay respectively (Table 4). The study further observed that all mangrove plants harbor bacterial endophytes with various enzymatic activities as shown in Fig. (2). High cellulases activity was observed in isolates from Lumnitzera racemosa. High chitinases activity was observed in isolates from Avicenia marina as shown in Fig. (2). Pectinase activity was highest in isolates from Xylocarpus granatum. Fig. (2). Graph showing enzymatic activities of the different mangrove plants. Two way ANOVA p=0.0006, F (5,24) =6.496. Endophytes are known to colonize plant tissues using enzymes involved in the infection process by degrading the plant tissues . In this study, the leaves harbored more endophytic bacteria compared to the roots. This is in line with previous studies that have shown leaves of Arabidopsis thaliana harbored more endophytes than roots . This may be attributed to high photosynthetic metabolism in the leaf hence the products could be utilized by the microbes. Most endophytic bacterial isolates were obtained from Xylocarpus granatum plant while least number was obtained from Lumnitzera racemosa this may be attributed to cultivation conditions since this plant grows in different zonation, the conditions (media) used to cultivate may have been optimal for isolates from Xylocarpus granatum. The study observed that all mangrove plants harbored isolates with various enzymatic activities. Similar studies on enzyme production by bacterial endophytes from leaves and stem of mangrove plants such as Rhizophora apiculata, Avicennia marina, Excoecaria agallocha, Ceriops decandra and Aegiceras corniculatum showed presence of chitinases, amylases, proteases, cellulases, and pectinases . In addition, studies conducted in bacteria endophytes of Rhizophora mangle and Avicenia nitida mangrove found in Brazilian mangrove forest showed the presence of endoglucanases and proteases . The study also revealed that members of Bacillus species were the most dominant in both the leaves and roots. This is in line with previous studies conducted on endophytes in mangrove plants found in Saudi Arabia that revealed the most dominant species being Bacillus . Bacillus and related species have also shown presence of proteases, pectinases and cellulases in endophytic bacteria of Paenibacillus polymyxa . The survival of these endophytes is attributed to their ability to utilize these cellulose and pectin in the plant tissues . The other dominant bacterial endophytes included the Streptomyces which was dominantly found in the leaves of Xylocarpus granatum plant. Similar studies conducted in Brazil showed the presence of bacterial endophytes identified to be Bacillus, Alcaligenes and Stenotrophomonas in the leaves and stem of Rhizophora mangle and Avicenia nitida . This may imply that the mangrove plants harbor similar microorganism however further work needs to be done in other mangrove ecosystems in tropical Africa to confirm the same. In this study results showed most of the isolates identified to be Bacillus species, for example, isolate GSN1XGroot from the roots of Xylocarpus granatum collected from Gazi bay expressed presence of amylases, caseinases, cellulases and chitinases suggesting a possible ecological role of these enzymes in the symbiotic relationship of the isolates and the host plants . The study showed pectinases activity was present in isolates identified to be Bacillus, Streptomyces, Achromobacter and, Pseudomonas in line with previous studies that have shown bacterial endophytes having pectinases enzymes . However four isolates did not show pectinases and these were identified to be Staphylococci, Stenotrophomonas, Pseudochrobactrum and Alcaligens suggesting that the enzyme is not actively expressed or is merely lacking in the isolates. However previous have shown the presence of pectinases in Stenotrophomonas isolated from algae . The isolates MXG2leaf and MA7XGleaf identified to be Klebsiella isolated from the leaves of Xylocarpus granatum obtained from Mida creek did not express amylases activity. Previous studies show that Klebsiella have amylases  suggesting that the enzyme is not actively expressed or is merely lacking in the isolates. The study showed all isolates belonging to Bacillus showed the presence of proteolytic and amylases activity suggesting possible expression of these enzymes and their potential role in degrading starch and protein organic matter in the ecosystem. However, isolate MD12BGroot isolated from the root of Bruigeria gymnorhiza obtained from Mida creek and Gazi bay and isolate MA4XGleaf isolated from leaves of Xylocarpus granatum obtained from Mida creek did not show presence of amylases indicating the enzyme is not actively expressed. Similar studies on bacterial endophytes of Curcuma have shown the presence of amylases in the Bacillus species . The presence of cellulases activity was exhibited by isolates identified to be Bacillus, Myroides, Pseudochrobactrum, and Serratia. This is in line with previous studies that have shown the presence of cellulases in bacteria endophytes cultivated from soybean . However the isolates MAM22Root identified to be Streptomyces species isolated from the roots of Avicenia marina obtained from Mida Creek, GR3XGroot suspected to be Pseudomonas species isolated from the root of Xylocarpus granatum obtained from Gazi bay and MAMSAM21leaf identified to be Alcaligenes species isolated from the leaves of Aviccenia marina obtained from Mida creek did not express cellulases suggesting that the enzyme is not actively expressed or is merely lacking in the isolates. These reference organisms have been reported to express cellulases enzyme . The isolates identified to be Bacillus and Streptomyces showed the presence of chitinases activity suggesting the possible role of these enzymes in the isolates. Similar studies have shown the presence of chitinases in Streptomyces species  and Pseudomonas species  However isolates R3XGroot obtained from the root of Xylocarpus granatum identified to be Pseudomonas, MR27RMleaf isolated from leaves of Rhizophora mucronata obtained from Mida creek identified to be Serratia and SNSroot isolated from the root of Xylocarpus granatum obtained from Gazi bay identified to be Bacillus all did not express chitinases activity suggesting that the enzyme is not actively expressed or is merely lacking in the isolates. The study revealed that Mangrove plants from Kenya’s coastal region harbor endophytes with potential enzymes that can be applicable in industries such as detergent, textile, and agrochemical. The enzyme cellulases were dominantly present in most isolates while chitinases was least present. Most isolates from mangrove plant Xylocarpus granatum showed the enzymatic activity of all the enzymes tested this could be attributed to the fact that it is a medicinal plants hence its endophytes could have bioactive compounds synthesizes by these enzymes. Most of the enzymatic activity was observed in isolates from leaves when compared with those from the roots which could be attributed to the fact that the leaves have high metabolic activities due to photosynthesis. . This is the first report showing the isolation of bacterial endophytes from the leaves and roots of mangrove plants with screening for enzymatic activity. Mangrove plants in Kenya are native plants with diverse medicinal applications and the study reveals they also provide a source of endophytic bacteria community with potential beneficial applications. RN carried out carried out the isolation, screening for enzymatic activities, analyzed the data and wrote the manuscript. JN designed the study, analyzed the data and reviewed the manuscript; AKN assisted in molecular characterization and reviewed the manuscript, WL Facilitated the laboratory space and equipments for the study. JK assisted in molecular characterization. All authors read and approved the final manuscript. The study was funded by Kenyatta University Vice-Chancellors’ Research Grant and DAAD in country/in region PHD Scholarship. Kumar A, Singh R, Yadav A, Singh D D G P K. Isolation and characterization of bacterial endophytes of Curcuma longa L. 3 Biotech 2016; 6(1): 1-8. Paul NC, Ji SH, Deng JX, Yu SH. Assemblages of endophytic bacteria in chili pepper (Capsicum annuum L.) and their antifungal activity against phytopathogens in vitro. Plant Omics Journal 2013; 6(6): 441-8. Heijden M G A, Van Der , Sessitsch A. Climate change effects on bene¢cial plant-microorganism interactions 2010; 73: 197-214. Hong K, Gao A, Xie Q, Gao H, Zhuang L, Lin H. Actinomycetes for marine drug discovery isolated from mangrove soils and plants in China. Marine Drugs 2009; 7: 24-44. Saad S, Taher M, Susanti D, Qaralleh H, Rahim NABA. Antimicrobial activity of mangrove plant (Lumnitzera littorea). Asian Pac J Trop Med 2011; 4(7): 523-5. Zhao L, Xu Y, Lai X, Shan C, Deng Z, Ji Y. Screening and characterization of endophytic Bacillus and Paenibacillus strains from medicinal plant Lonicera japonica for use as potential plant growth promoters 2015; 989: 977-89. Khianngam S, Pootaeng-on Y, Techakriengkrai T, Tanasupawat S. Screening and identification of cellulase producing bacteria isolated from oil palm meal 2014; 4(4): 90-6. Aliferis K A, Seguin P, Rani M, Samson R, Jabaji S. Isolation and characterization of indigenous endophytic bacteria associated with leaves of switchgrass (Panicum virgatum L.) cultivars.2013. Jussara A, Carrim I, Barbosa EC, Gonçalves JD. Enzymatic activity of endophytic bacterial isolates of jacaranda decurrens Cham. (Carobinha-do-campo). Braz Arch Biol Technol 2006; 49(May): 353-9. Adewale A M, Kheng G J, Ping L S, Yien T A S. Antimicrobial and enzymatic activities of endophytic bacteria isolated from Mentha spicata (MINT). Malays J Microbiol 2015; 11(2, SI): 102-8. Janssen PH, Yates PS, Grinton BE, Taylor PM, Sait M. Improved culturability of soil bacteria and isolation in pure culture of novel members of the divisions Acidobacteria, Actinobacteria, Proteobacteria, and Verrucomicrobia. Appl Environ Microbiol 2002; 68(5): 2391-6. James G Cappucino, Natalie Shermann. A text book of Laboratory manual 10th Ed. 2014. Bibi F, Ullah I, Alvi SA, et al. Isolation, diversity, and biotechnological potential of rhizo- and endophytic bacteria associated with mangrove plants from Saudi Arabia. Genet Mol Res 2017; 16(2): 1-12.
 da Cruz Ramos GF, Ramos PL, Passarini MRZ, et al. Cellulolytic and proteolytic ability of bacteria isolated from gastrointestinal tract and composting of a hippopotamus. AMB Express 2016; 6(1): 17. Hung PQ, Kumar SM, Govindsamy V. Isolation and characterization of endophytic bacteria from wild and cultivated soybean varieties. Biol Fertil Soils 2007; 44: 155-62. Araújo L E. I solation and characterisation of endophytic bacteria isolated from the leaves of the common bean (Phaseolus vuglaris). Braz J Microbiol 2012; 0: 1562-75. Priya CS, Jagannathan N, Kalaichelvan PT. Production of chitinases by streptomyces hygroscopicus VMCH2 by optimisation of cultral conditions. Int J Pharma Bio Sci 2011; 2(2): 210-9. Miliute I, Buzaite O, Baniulis D, Stanys V. Bacterial endophytes in agricultural crops and their role in stress tolerance : A review 2015; 102(4): 465-78. Gayathri S, Saravanan D, Radhakrishnan M, Balagurunathan R, Kathiresan K. Bioprospecting potential of fast growing endophytic bacteria from leaves of mangrove and salt-marsh plant species. Indian J Biotechnol 2010; 9(4): 397-402. Padda K, Puri A, Zeng Qingwei. Effect of GFP-tagging on nitrogen fixation and plant growth promotion of an endophytic diazotrophic strain of Paenibacillus polymyxa. Canadian Science Publishers Botany 2017. Yang H, Puri A, Padda KP, Chanway CP, Sciences C, Centre FS. Substrate utilization by endophytic bacteria Paenibacillus polymyxa P2b-2R that may facilitate bacterial entrance and survival inside diverse plant hosts. Open Access Journal 2017; 41(90): 120-30. Pradesh H. Molecular identification, production and optimization of pectinase by using Stenotrophomonas maltophilia P9 Isolated from Algal Biomass of Himachal Pradesh, India.2018; 7(1): 670-80. Kumar A, Singh R, Yadav A, Singh D D G P K. Isolation and characterization of bacterial endophytes of Curcuma longa L . 3 Biotech 2016; 6(1): 1-8. Sindhu SS, Dadarwal KR. Chitinolytic and cellulolytic Pseudomonas sp. antagonistic to fungal pathogens enhances nodulation by Mesorhizobium sp. Cicer in chickpea. Microbiol Res 2001; 156(4): 353-8.